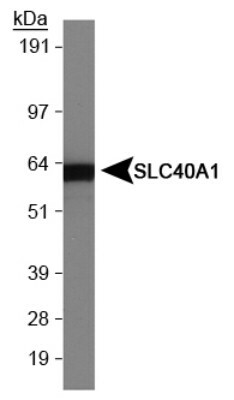 SLC40A1 is an iron-regulated transporter assumed to play roles in intestinal iron absorption and cellular iron release. It mediates iron efflux in the presence of ferroxidase. Defects in SLC40A1 cause hemochromatosis type 4 (HFE4), which is an autosomal dominant iron-loading disorder. Synthetic peptide made to an internal portion of the human protein (within residues 250-300). Reacts with human SLC40A1 protein.